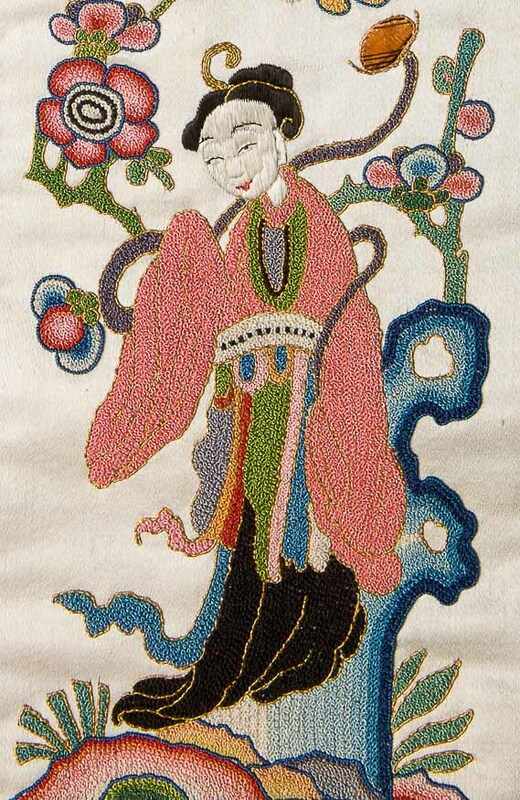 In China, embroidery is regarded as one of the oldest techniques of textile decoration whose tradition is over 4000 years old. 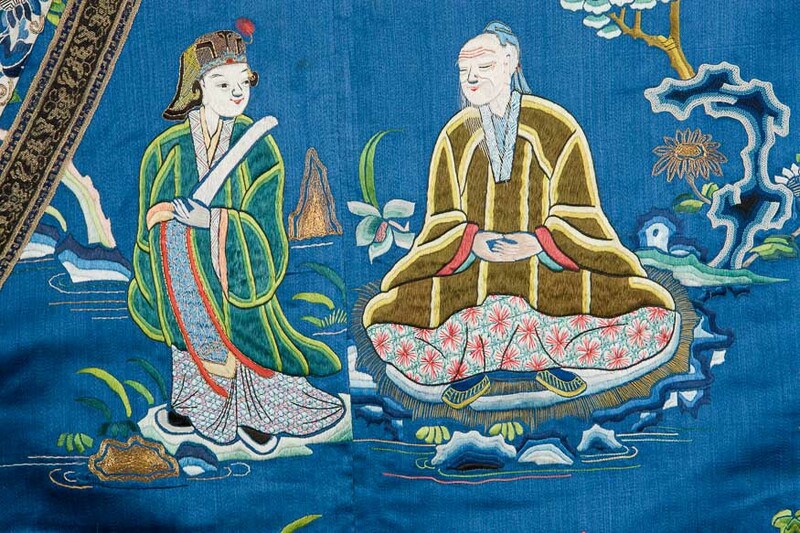 From a very early age, Chinese women learned this craft from their mothers by embroidering robes and clothing accessories such as shoes, fans, all kinds of sachets, scrolls imitating paintings as well as tapestries and screens. 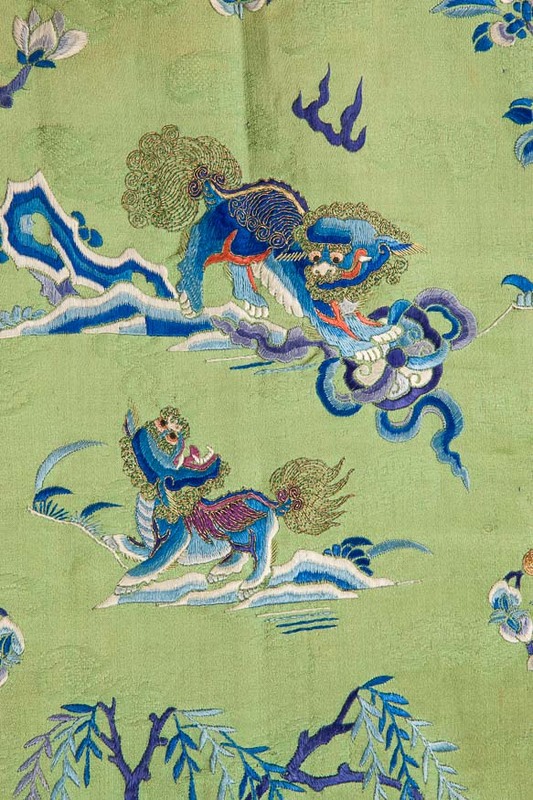 The Qing Dynasty constituted the finest period of the development of this decorative technique. The most talented embroiderers of that era belonged to the elite, and their work was considered as art. One of these figures was Ding Pei, active in the first half of the 19th century, the author of the treaty on embroidery Xiupu (1821). She compared embroidery to the art of calligraphy saying: „The needle is your brush, the silk – your paper, and ink – your thread”. Ding Pei referred to the embroidery process not only in its aesthetic dimension, but also in its moral aspect. She thought that the study of theory and practice influenced the advancement of women. 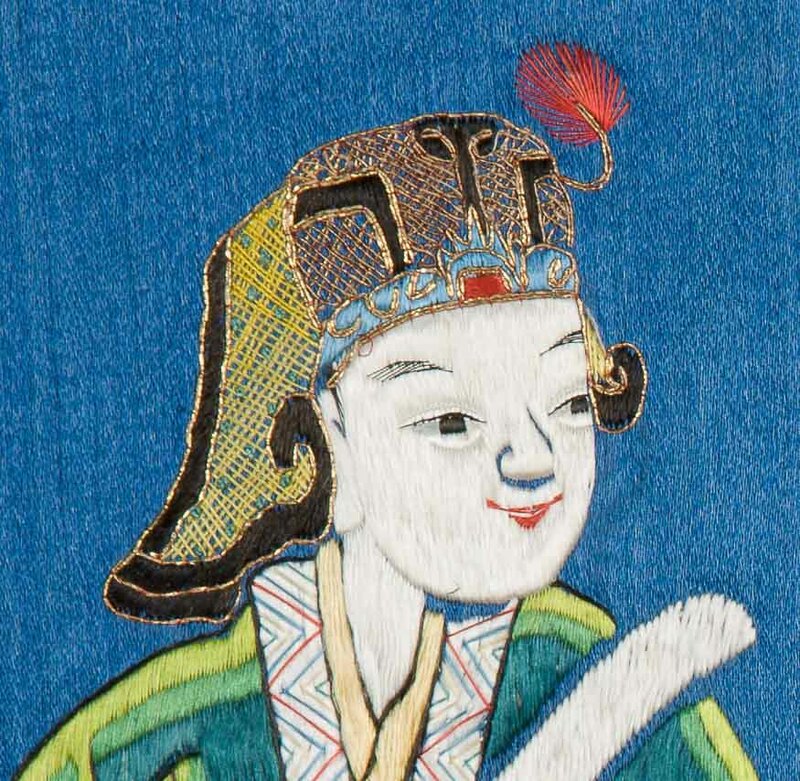 Embroidery developed many regional styles, the most important being: Beijijng (Jingxiu), Suzhou (Shuxiu), Guangdong (Yuexiu), Hunan (Xiangxiu) and Sichuan (Shixiu). The most frequently used embroidery stitches included: flat stitch, chain stitch, cord, couching stitch and knot stitch. 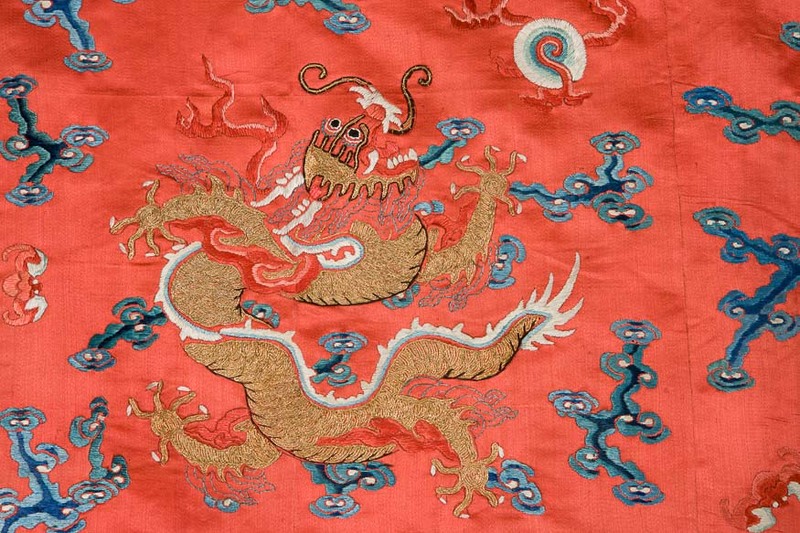 The mastery of Chinese handicrafts of the last imperial era can be admired until July 2015 at the exhibition titled "In the Realm of the Dragon". Beata Pacana – art historian, adjunct, Head of Department of Far Eastern Art, National Museum in Krakow, curator of the exhibition "In the Realm of the Dragon. Chinese Art in the Collections of the National Museum in Krakow". Woman's robe ao (fragment) Qing Dynasty, early 20th century. Silk, golden thread, sequins, embroidery. The cuffs of woman's robe are decorated with the image of He Xiangu – one of the Eight Immortals (baxian). Her figure was embroidered with knot stitch. 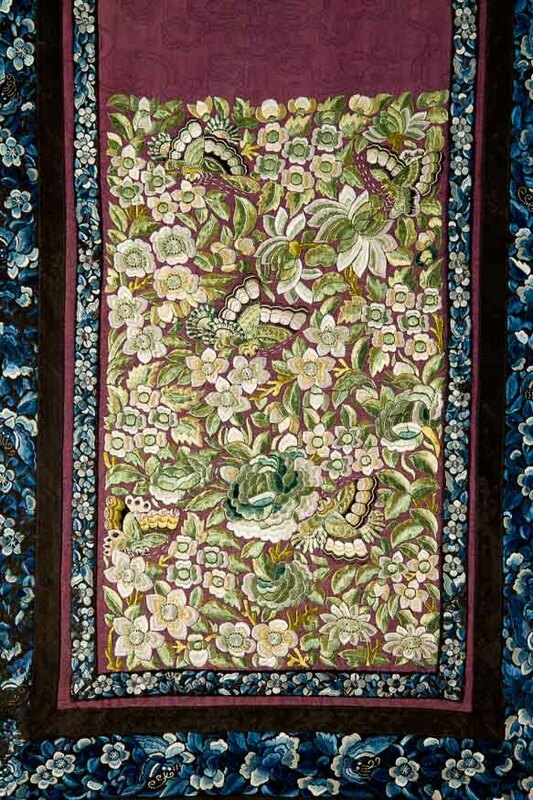 Qun skirt with a motif depicting a flower and a butterfly (fragment) Qing Dynasty, 19th century. 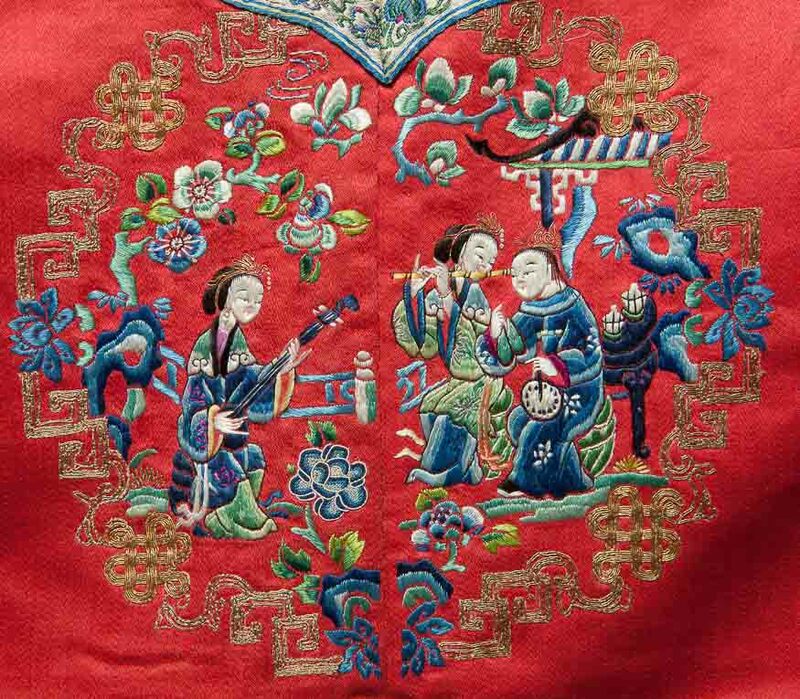 Embroidery in blue hues (sanlan) with a popular motif depicting flowers and fruit (hua guo). 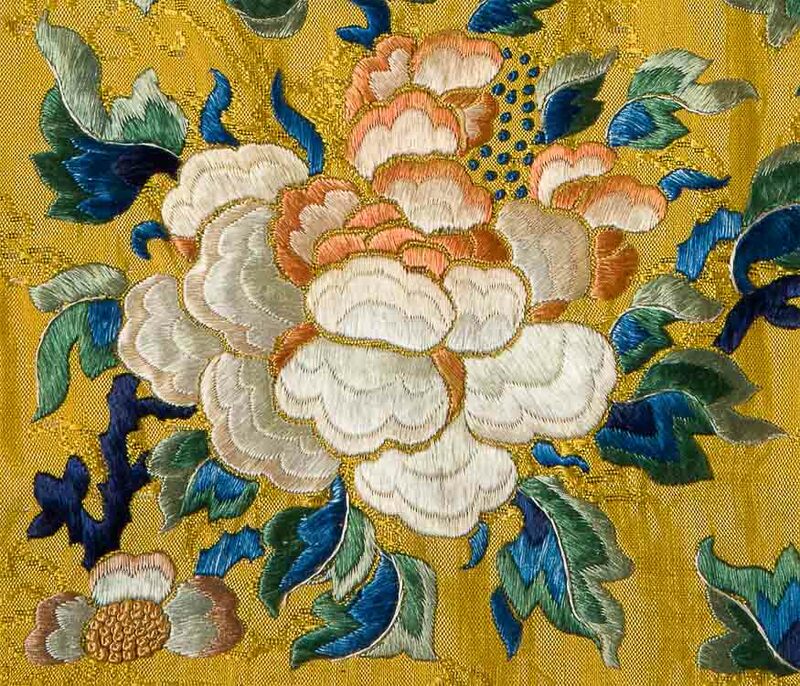 As ornaments on ladies' robes, they symbolise numerous virtues: lotus flower – purity and modesty, peony – beauty, chrysanthemum – longevity, plum – innocence. Melon, on the other hand, is a symbol of unity and strength of the family. 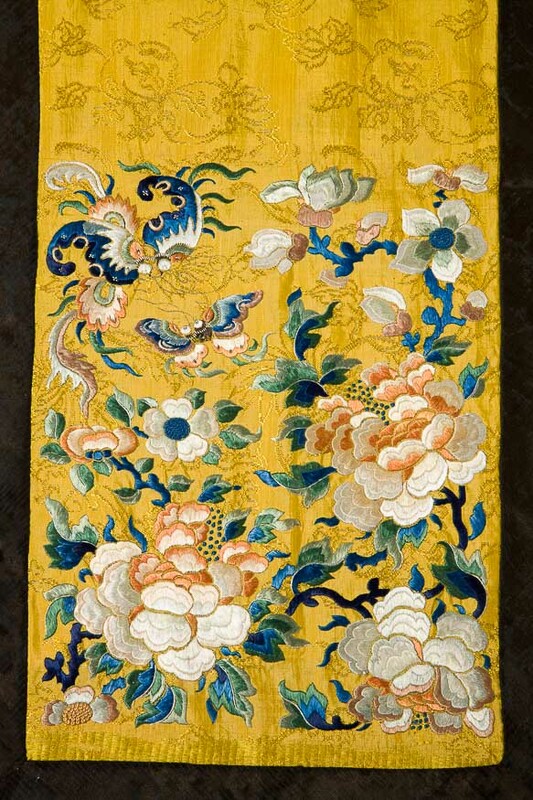 Qun skirt with a motif depicting a plum blossom, a peony and a butterfly (fragment) Qing Dynasty, 19th century. 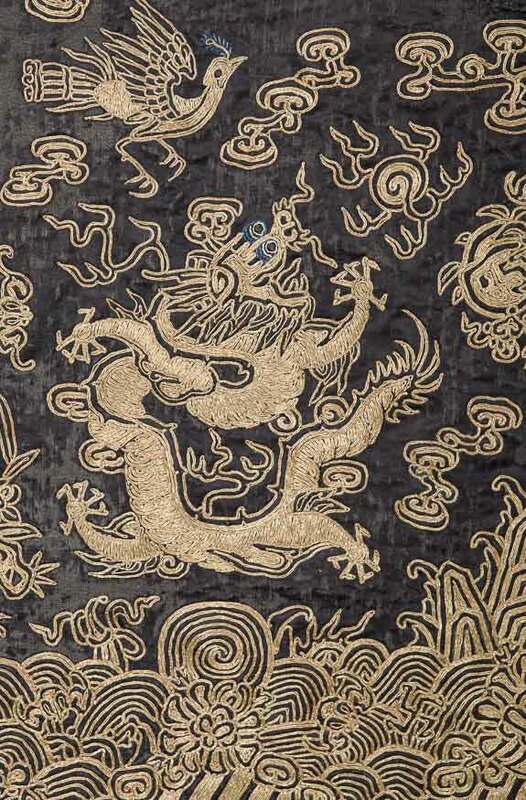 Woman's wedding robe mang ao (fragment) Qing Dynasty, second half of the 19th century. Theatre costume (fragment) Qing Dynasty, 19th-20th century. Silk, golden thread, metal mirrors, glass, embroidery. 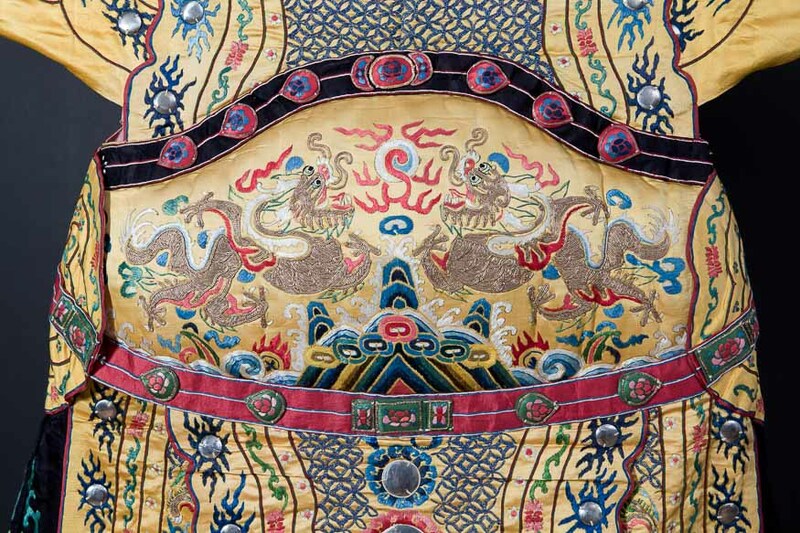 The front part of the theatre costume features gold couching embroidery depicting a pair of dragons facing each other with a flaming pearl. Qun skirt with a motif depicting a flower and a butterfly (fragment) Qing Dynasty, c. mid-19th century. The skirt was decorated with Beijing embroidery. 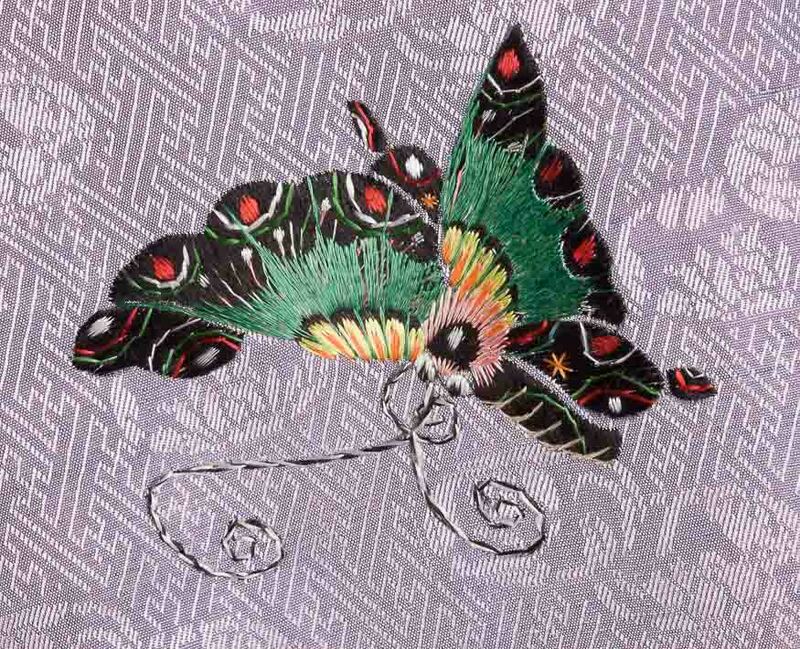 This kind of ornamentation was created using chiefly flat satin stitch. Its distinctive feature is horror vacui – motifs depicting flowers and butterflies fill the whole decorated space. 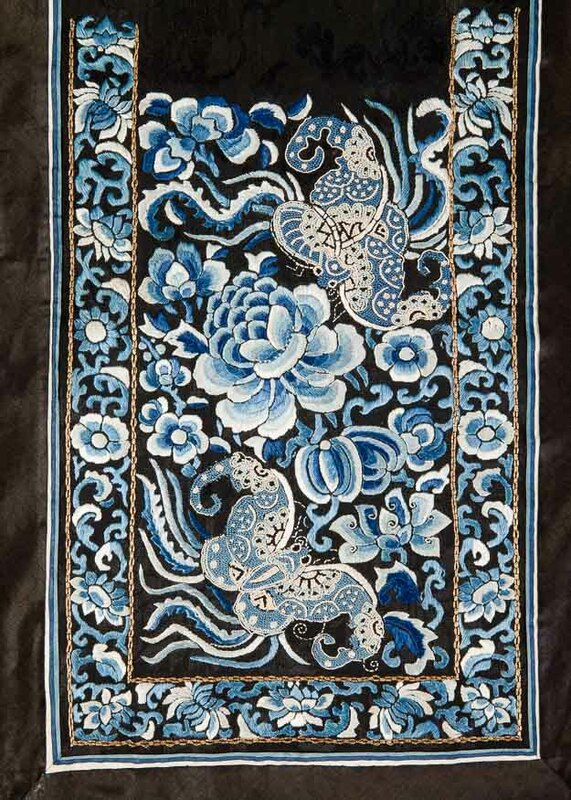 Woman's vest majia (fragment) Qing Dynasty, 19th century. Silk, golden thread, embroidery, applique. Woman's robe waitao (fragment) Qing Dynasty, 19th -20th century. In Chinese culture, a butterfly is a symbol of summer, beauty and dreams. When juxtaposed with a flower, it symbolises marital fidelity. Woman's robe magua (fragment) Qing Dynasty, 19th century. Silk, cotton, golden thread, embroidery, applique. Woman's waistcoat xia pei (fragment) Qing Dynasty, second half of the 19th century.